Intricately detailed, this stunning butterfly pendant would make a wonderful gift for a loved one. Crafted from 9ct yellow gold and rhodium detailing, this beautiful pendant features yellow gold swirl detailing set into the wings, and is finished with pretty diamond cut detailing on the outlines. Set on an 18" chain. 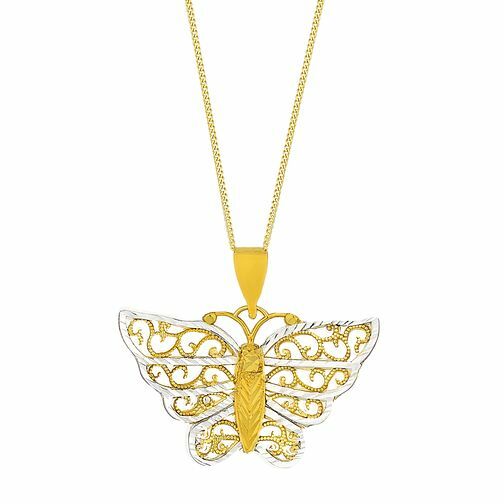 9ct Yellow Gold & Rhodium 18" Butterfly Pendant is rated 3.0 out of 5 by 2. Rated 1 out of 5 by Anonymous from This product is rusty I bought this necklace few months ago and I'm was shocked to see both the necklace and pendant have started rusting. They look completely discoloured even though I don't wear perfume or any form of fragrance. The quality is really poor and the pendant is a lot smaller than it appears online. Rated 5 out of 5 by Anonymous from Beautiful detail This product has a lot of beautiful pieces of detail that make it catch the eye. My partners eyes lit up the moment she opened the case and hasn't taken it off since. The one recommendation I would suggest is perhaps upgrading the note inside. Perhaps having it printed direct onto the card instead of onto a sticky label and also an image of it when ordering would help along with font and size adjustments would really improve this part of the gift.